The exceptional theatre students of IU South Bend had the chance to participate and compete in a theatre festival held in Indianapolis, Ind., January 10-15. The festival was held at both Butler University and the University of Indianapolis. The Kennedy Center American College Theatre Festival (KCACTF) hosts regional conferences across the country in preparation for their national conference at the Kennedy Center in Washington D.C. each year. 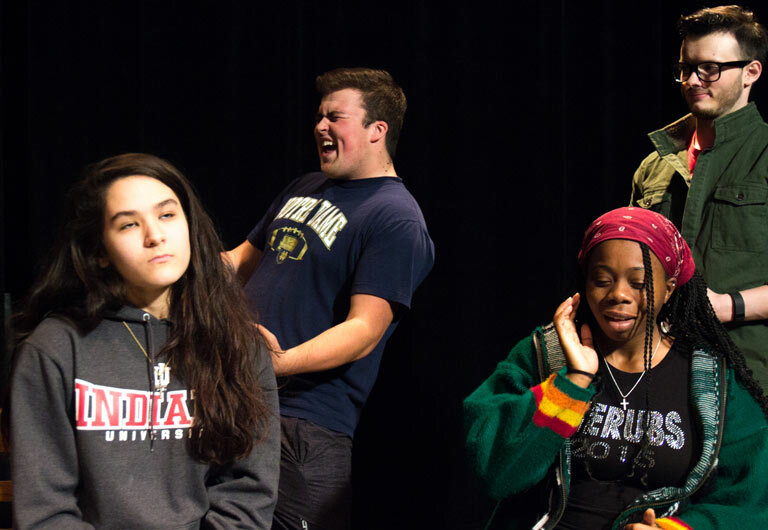 As a part of region 3, one of the largest regions in the country that encapsulates Wisconsin, Ohio, Illinois, Michigan and Indiana, IU South Bend theatre and dance productions are a part of regional conference throughout the school year. As a member of region 3, any student demonstrating excellence in their craft (performance or design/technical theatre) can be nominated to show their work at the regional festival. Design and Technology student Jacob Medich took his Scenic Design of The Shape of Things to the festival in January. As part of the National KCACTF Awards for Theatrical Design Excellence, Jacob displayed his design as part of a juried critique of his work. Five theatre industry professionals from all different parts of the country spoke with Jacob about his design from concept to execution. They had a lot of great feedback that helped Jacob see ways he could improve his designs in the future. Over the course of this year, eight students were nominated for their performances in our shows. They were: Javon Barnes and Tristan Conner (for their work in our children’s show The Legend of John Henry), Tyler Marcotte and Jordyn Nutting (for their work in The Musical of Musicals, [The Musical! ]), Dakota Word and Cassie Gaines (for their work in Opus), and Kendra Turner and Patrick Watterson (for their work in The Shape of Things). Five of the nominated students and their partners were able to attend the festival in January of 2017 and compete for the Irene Ryan Acting Scholarship. The students that competed are: Tyler Marcotte and partner Jacob Medich, Dakota Word and partner John Van Paris, Cassie Gaines and partner Matt Magaldi, Kendra Turner and partner Jack Saunders and Tristan Conner and partner Kala Erickson. Our students prepared very well for this experience; choosing material, coaching throughout the fall and truly working to define and refine their audition package (that, overall, consisted of one scene, one monologue and a second scene [musical or play]). The Department of Theatre and Dance is very proud of there work leading up to and at the festival itself. Further, there are three competitive rounds to the Irene Ryan Scholarship, with round one consisting of all 300+ nominees from the region performing their solo piece and one scene. From this, the judges nominate 45 nominees and their partners from round 1 to compete in round 2. We are pleased to report that three of the five nominees and their partners were invited to continue on in the competition to round 2 (Dakota Word and partner John Van Paris, Tristan Conner and partner Kala Erickson and Kendra Turner and partner Jack Saunders). For this round the students performed both scenes. This is a high honor indeed and our students worked very hard for this. Finally, the last round of competitors were announced. For the final round of the Irene Ryan Scholarship Acting competition, 16 of the original 300+ nominees and their partners were invited to compete. This round consisted of their entire prepared audition package (consisting of one solo piece, and two scenes). One of our nominees Kendra Turner, and her partner Jack Saunders, both first year BFA Theatre majors with a concentration in Musical Theatre Performance, were invited through to the final round and they represented the department and school very well. The students performed at a very high level in front of the festival attendees, many professionals, and the judges panel (of which included casting directors and actors from around the country). This is a truly momentous experience and our students indelibly rose to the occasion and performed freely and fabulously. In addition to this, Tristan Conner auditioned for and was cast in the ten-minute play festival of new works and Kendra Turner auditioned for and was cast in the Musical Theatre Intensive. The Department of Theatre and Dance is very proud of our students' work and look forward to many festivals to come.